The affidavit by the secretaries should be filed on or before October 22, since the time-frame for the removal of the boards expires on Monday. KOCHI: The government circular against illegal flex boards will apply not only to large flexes or billboards but all advertisement boards, big or small, including banners and flags of political parties, the High Court said on Thursday. It also directed the removal of all boards that fall under the mandate of the circular before October 15. “The erection of illegal boards should be seen as an offence and persons who do so should be prosecuted. The applicable tariff will have to be recovered from them on the ‘polluter pays’ principle so that the state or local self-government institutions do not suffer the large expenses required for the disposal of the boards,” held the court. It directed secretaries of six municipalities to file an affidavit explaining how many illegal flex boards, advertisement boards and billboards have been removed by their respective corporations based on the circular issued on September 6. Has any penalty been levied from the persons for whose benefit these boards have been installed? 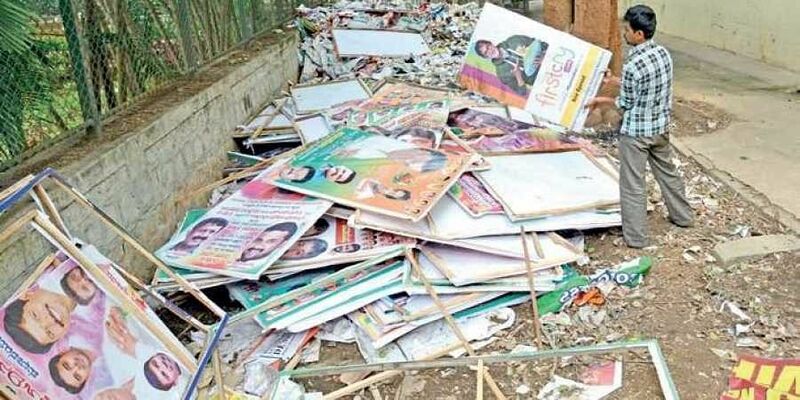 What would have been the applicable advertisement tariff, which could have been collected, had these boards been legally sanctioned; and has any such amount been collected from the individuals and entities who have put up these illegal boards, and if not why? The court also wanted to know the details of expenses suffered by local self-government institutions for removing and disposing of the boards after the date on which the government circular has come into effect and the manner in which these boards are being disposed of. The court directed the secretaries to inform the steps taken or proposed to ensure that no illegal flex boards are erected in future. When the case came up for hearing, some of the counsels for the local government institutions submitted that even if existing boards are removed, new ones will appear since there is no effective mechanism in the circular to prevent this. To which the court replied that it is the responsibility of the secretary of the respective local self-government institutions, through the field officers and health officers attached to it, to report promptly regarding such illegal boards and to take action to remove them without fail. “By doing so, the persons and entities who erect these boards will get the message loud and clear that such boards cannot and will not be tolerated and it can thus be regulated effectively, particularly if the local self-government institutions decide to levy full advertisement tariff for such boards,” said the court.